Image caption What to wear when it's beach weather in the office? Only mad dogs and Englishmen wear suits to work in the kind of weather we've been having in the UK over the last few days. 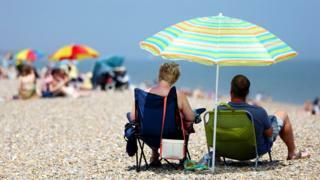 On Tuesday in London temperatures are due to hit the mid-twenties again while rush hour is still in full swing. It will be 25C by lunchtime in Manchester and Birmingham. On cue, the TUC is calling on employers to relax their workplace dress codes to save us sweltering again in ties, jackets and long sleeves. Many people already delight in the opportunity to switch to short sleeves, sandals, even shorts in very tolerant workplaces. But more formal employers are still expecting staff to be buttoned up. Media captionShould we be able to dress down for work during the heat wave? Londoner Oliver Leigh, 23, says he is "dripping" by the time he arrives at work in his suit. "I step off the tube looking like I've just got out of the shower." "I'd love to be able to dress down," he says, but he works in private healthcare and he's expected to dress formally. There is more flexibility for women who can switch to sandals and short sleeves without breaching traditional dress codes. But Ally Everett, 34, who works in advertising, and is in a sleeveless summer blouse, thinks there's room for more flexibility even for men. "I think you can dress well without being in a suit," she says. "Your professionalism comes across in your attitude not in what you're wearing." As long as you aren't showing too much skin, male or female, it should be fine to dress more casually, she says. TUC general secretary Frances O'Grady argues it's time for new policies in UK workplaces. "Obviously shorts and flip flops won't be the right attire for all workers, but no one should be made to suffer unnecessarily in the heat for the sake of appearances," she says. "While many of us will welcome the sunshine and warm temperatures this week, working in sweltering conditions can be unbearable and dangerous." In winter there is a legal minimum temperature that workers can be asked to endure (below 16C, or 13C if they are doing physically demanding work). But there are no restrictions for when temperatures soar. The TUC is proposing an indoor maximum temperature of 30C, with employers forced to introduce cooling measures when the temperature hits 24C. Provide a ready supply of cool drinks. Office sauna: Must-have or hot air?